is to report the doings of the miraculous spirit of life that everywhere throbs and works. over with hints which speak to the intelligent. thought can be written, first or last; and he would report the Holy Ghost, or attempt it. draws his rents from rage and pain. By acting rashly, he buys the power of talking wisely. things turns. Nature has dearly at heart the formation of the speculative man, or scholar. and the solid portion of the community is named with significant respect in every circle. their votes in November,- is practical and commendable. to do the same again. The first act, which was to be an experiment, becomes a sacrament. greatest action may easily be one of the most private circumstance. be orator, artist, craftsman, or king. Goethe to represent the powers and duties of the scholar or writer. reading-rooms and book-clubs without number. There was never such a miscellany of facts. multitude of things, which is distracting. pierce these and to draw his strength from nature, with which he lived in full communion. out of every pore of his skin), strikes the harp with a hero’s strength and grace. and one step farther he hazarded, and brought himself safe back. periods of belief, of omens, of luck, or whatever else, refuses to be forgotten. initiated in the life of Vienna and of Heidelberg in 1820,- or he shall not exist. begun its office and has millions of readers yet to serve. highly stimulating to intellect and courage. and it remained his favorite reading to the end of his life. intelligible interest or party, or in regular opposition to any, the public is satisfied. it for? What does the man mean? Whence, whence all these thoughts? we how adroit, how fluent, how brilliant he is? athletic and nimble,- can go far and live long. has confided himself more to this man than to any other. but with peremptory heed that he should not be for a moment prejudiced by his instruments. He lays a ray of light under every fact, and between himself and his dearest property. emperors, who fight dignifiedly across kingdoms. whilst the clouds of egotists drifting about him are only interested in a low success. drawing of the lines from Goethe to Kepler, from Goethe to Bacon, from Goethe to Newton. comparable to that of Iphigenia and Faust. I suppose the worldly tone of his tales grew out of the calculations of self-culture. idea of absolute, eternal truth, without reference to my own enlargement by it, is higher. eighty years with the steadiness of his first zeal. to draw rents and revenues from the immense patrimony of the old and the recent ages. and first, last, midst and without end, to honor every truth by use. 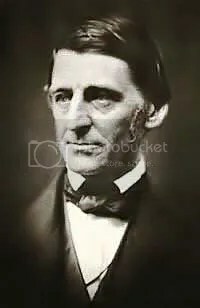 source, from the connection in which it appears in Emerson’s notebook.